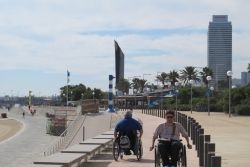 The 720 metre-long Bogatell Beach is one of the beaches that was regenerated when the Barcelona seafront was restored during the 1990s for the Olympic Games. Renowned for its safe bathing, it is one of the most popular and fashionable beaches for the young and trendy population. This beach can be easily reached by bike as it is bordered by a cycle path and has a ping pong table next to the Bogatell breakwater and another table and a volleyball court at the other end of the beach next to the Mar Bella breakwater.